poster – initial thoughts !! to understand how architectural elements and space changes behavior of people around, i selected a very simple part of space, a window. the window is essentially a HOLE in the WALL, which does many things to the space and to people around it. also people effect the window in different ways, they interact and behave with window in different ways. 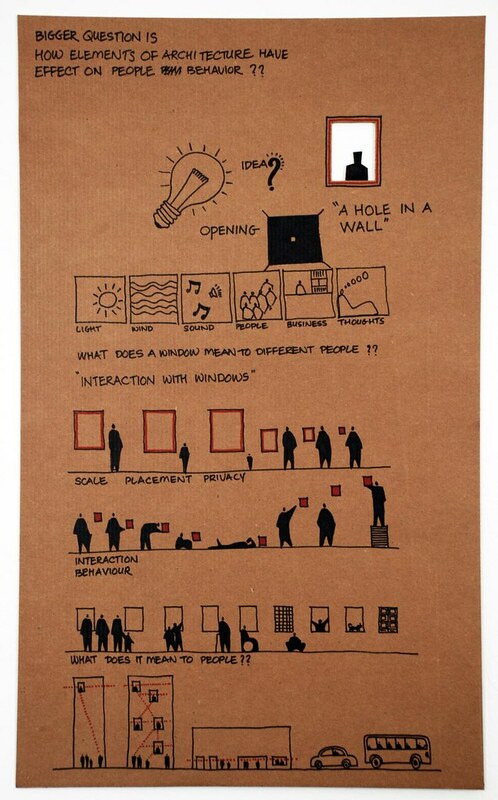 This poster is an exploration of, how a window and user both are effecting each other? How scale, position and context changes people’s behavior around? How does everyone has different meanings of an opening in a wall? This is just a small study to understand different relationships between a window, space and people around it. I see this thesis as a chance to explore and understand people behaviour towards architectural elements. I would like to explore role of interaction design to enhance architectural experiences. I want this thesis to be a continues learning process, rather then a particular goal. It should be an extension of my understanding of making beautiful places and experiences. I like to build myths and stories around my work, like metaphors, they add joy and life. I am always inspired by small, simple and beautiful things. Things that gives joy, curiosity as a child, things that invite you to touch, feel, play and learn. I am inspired by power of architecture, though it is vast a subjects, but there are very small pockets where it just creates wonderful feelings, lifelong memories and joy. One of the most interactive element in space is a window, a hole in a wall. As a metaphor, it means different things to different people and it serves different needs to every one. Every one is very personal relationship and way to interacting with “a hole in a wall”. As a quest for understanding how this hole effects human behaviours, my thesis will try and explore various interactions and means around window, and explore how technology can enhance these experiences. I am interested in making beautiful experiences, but with minimum technology and simple solutions. This thesis will also be an exploration of using simple but powerful technology. If I can ring a bell by just pulling a string rather then clicking a button, means much better and tangible interaction. Creating beautiful experiences but using simplest techniques. Try to use recycled or re-used materials. Make many small projects towards a broader thinking. I would like to build for real what I imagine to build. Learn and sharpen my skills. Build my future vision as a designer. Learn more programming and electronics, enough to be able to experiment on my own.